The Miami Herald has pointed out in an article that I suffered a genuine disgrace in 1987 in Connecticut, and I need to explain to anyone who is willing to listen what happened. I PROFOUNDLY APOLOGIZE TO YOU. I HAVE APOLOGIZED PROFOUNDLY TO SACRED JEB BUSH, WHO I BELIEVE HAS FORGIVEN ME, BUT I CONTINUE TO APOLOGIZE. SACRED GOVERNOR JEB BUSH IS A MY PERSONAL HERO, FOR MANY REASONS, the biggest of which is that I believe God created a Miracle in Miami, what I call, "The Internationalization of Miami ... The Cuban Miracle" (see my section on Asuntos Hispanos), and Sacred Jeb Bush, and his SACRED FLORIDA FAMILY along with over a million Divine Cuban-Americans, were in my opinion God's workers in Creating a MIRACLE for Miami. The disgrace I suffered in Connecticut in 1987 was in reality an incredible, diabolical, plot by my mother, who, through personal fraud and interstate Trustee mail and wire fraud: A. surreptitiously caused me a permanent injury in 1983; and B. diabolically, again through personal fraud and interstate Trustee mail and wire fraud, deceived me into believing the permanent injury she had surreptitiously caused me, was instead the result of the government using me as an experimental guinea pig, to see if dangerous medications, according to my lying mother, would harm me, for potential use against a third party. 5. My evil mother -- who suffered from the mental disease Munchausen's Syndrome by Proxy -- succeeded in diabolically A. causing me a permanent injury, and B. convincing me to file a personal injury lawsuit against the government, based upon her diabolically, through criminal fraud, convincing me that not she, but a government conspiracy to use me as a guinea pig, to test dangerous medications, was the cause of my permanent injury. The Secret Service was understandably upset, and since no one knew what absolute evil my mother was up to, ultimately arrested me in 1987. I discovered on my own in 1993 that my mother's theory was not supported by the evidence, and to try to regain my reputation, worked gang infested neighborhoods as a taxi driver, ultimately providing two-eyewitnesses to the Connecticut F.B.I., to two theretofore unsolved federal gang murders. Only in 1997, literally 17 years after my mother's personal and interstate Trustee fraud began, driven by her suffering from a variation of Munchausen's Syndrome by Proxy, did I realize -- when my cousin showed me his IRS Tax Return, which revealed my mother's ultimately 25 years of interstate Trustee mail and wire fraud -- that my mother had: A. diabolically CAUSED me the 1983 permanent injury, and, B. through diabolical fraud and deceit, engineered my horrendous disgrace. I humbly swear, under Florida and Federal penalties for perjury, that my mother was comparable -- albeit to a far, far, far lesser extreme -- to Casey Anthony. My mother, through criminal misconduct, caused me a permanent injury, and destroyed my reputation, and got away with it. Casey Anthony, as we know, killed her daughter Caylee Anthony, and got away with it. There is far more to say, and I will follow up, but this has a happy ending. I returned to Miami in 1998, and discovered GOD'S MIRACLE, again "The Internationalization of Miami ... The Cuban-American Miracle" -- please see my photo-essay of this title in my website page, "Asuntos Hispanos". This MIRACLE, as I have said, was greatly aided by SACRED Jeb Bush and his SACRED Family. AND, almost as if I were Jonah coming out of the whale, or Job, and SACRED Jeb Bush and his friends were God's Angels, he and his SACRED friends, including the Ros-Lehtinens and the Diaz-Balarts, rescued me from continuing interstate Trustee mail and wire fraud by my mother, who died in 2000, but more importantly rescued me from my sisters' multi-year attempt to steal my Miracle Mile property inheritance from my grandmother. I will follow up, but wanted to get this PROFOUND APOLOGY, AND EXPLANATION, to you -- submitted under penalties for perjury -- onto the website as soon as possible. 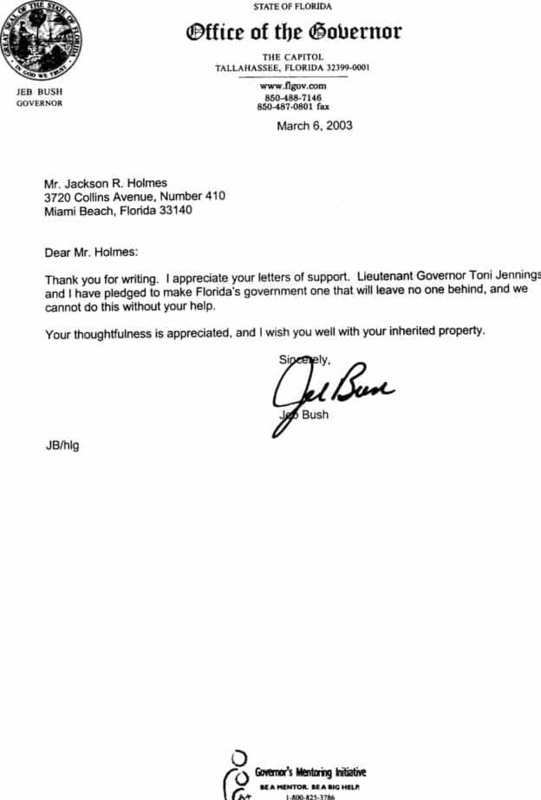 AGAIN, SACRED GOVERNOR JEB BUSH IS MY PERSONAL HERO, FOR THE FOREGOING, AND MANY OTHER REASONS. As for the misdemeanor domestic violence arrest, which was Dismissed, mentioned in The Miami Herald article, this was an immigration scam by my ex-wife. Under U.S. Immigration law, an immigrant spouse, in order to demonstrate that a marriage to a U.S. citizen is legitimate, and not undertaken to get around immigration laws, is required to stay in a marriage for two years. My ex-wife, wanting a "deportation-proof divorce", and knowing there is an exception to the foregoing immigration law if domestic violence is alleged, did so. 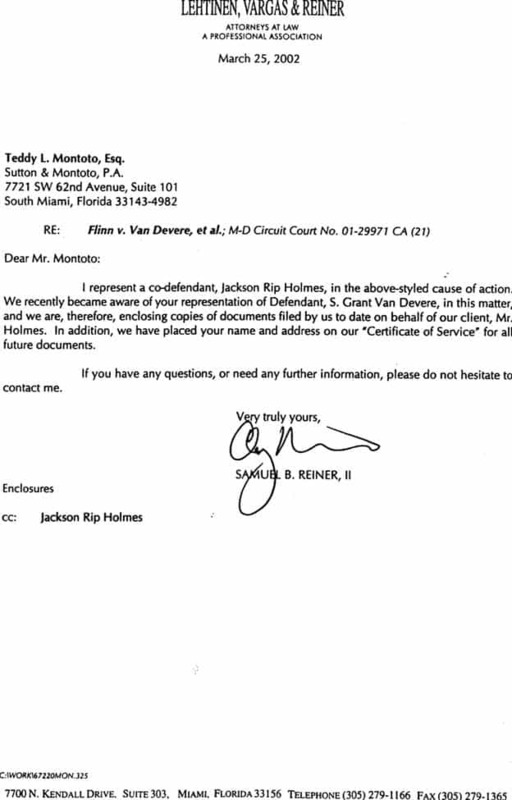 At considerable expense, I PROVED that my ex-wife had submitted a perurious complaint, and I was astounded when the State Attorney's Office, which itself obtained the testimony proving this at my request, did not arrest her for the crime of perjurious false statement. My former wife is a foreign-born Native American Indian. A question arises of why The Miami Herald, knowing the case was found without merit, and Dismissed, and knowing publication could cause needless turmoil for former family members -- including three SACRED children -- who all love each other, did so? Me in a group with State Attorney Katherine Fernandez-Rundle, December, 2010. I am happily married to Gavi E. Holmes, and we live with her/our daughter Angie, photo below.